With the spread of capitalism - a socio-economic system that produces both wealth and poverty simultaneously - the spatial dynamics of the "global(izing)" city are creating more division between social classes, not less. This means that in the 21st-century, large cities around the world exhibit intensifying spatial inequality taking the form of a wealthy, privileged urban core ringed by a periphery of lower-income denizens far removed from the city’s resources and amenities. This trend toward swelling socio-spatial division is especially pronounced in cities purporting to be "global", or in the case of Johannesburg, South Africa’s financial capital, a "world-class African city." Ironically, Johannesburg’s historical legacy of immense spatial inequality thanks to apartheid is the direction in which most "global(izing)" cities such as New York, Cairo, London, Shanghai, New Delhi, Jakarta, Lagos, Berlin, and São Paulo are headed. The globalization of neoliberal urban policy has made the city less welcoming, liveable, accessible and friendly for lower-income city residents. 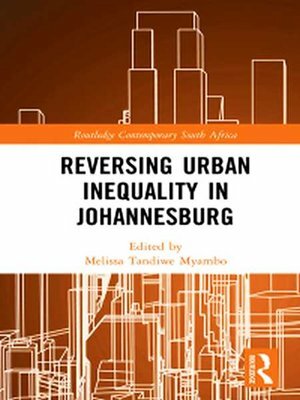 This book asks if Johannesburg can unstitch its complex urban fabric to create a city with more democratic public transport, affordable housing in desirable locations and safe, socially and racially integrated public spaces. These pithy, solidly researched, accessibly written essays are instructive for all those who are interested in questions of spatial justice, urban development, history and planning and the general goal of making cities more livable and accessible for urban dwellers of all income levels.